I'd rather have more displacement and the attendant greater torque. Will this option be available for the US and for all models? 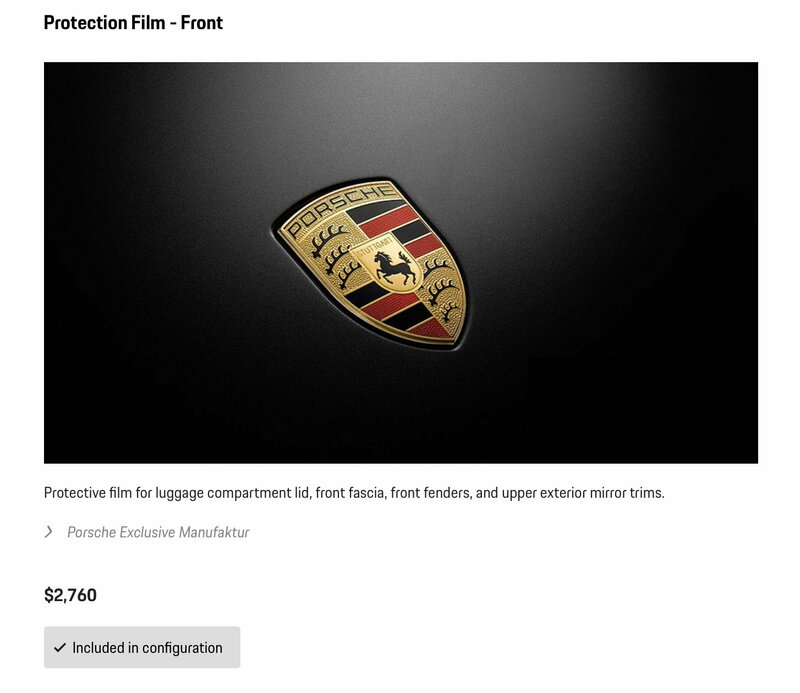 What type of PPF will Porsche use? Will it be like Xpel, self healing? I got my entire car done in xpel for $2,400. Not sure I would pay a porsche premium on this. That's a smoking hot deal. I doubt you can replicate that reliably in a lot of the country. Also if you're doing European delivery, PPF isn't as common. Ha, I didnt price around, but good to know its a good price. I had planned on finding a new place because the place I used didnt know how to keep appointments. Took a total of 4 trips to get the whole car done. First trip, they forgot about my booking and couldnt fit me in that day at all, needed to reschedule 3 weeks out. So I learned to call before I drove the hour to their shop. Second time, called at 8am to confirm my 9am appt, they had me down. So I drive in to find out they thought I was dropping the car off over night. I explained no, when i made the appt that I would want it all done in a day and I would work in their waiting area, which they had agreed to on the phone. That did happen because another car was scheduled that morning and the installer wouldnt be free until the afternoon and they could only do half of my car. So stayed the whole day for the front to be done in the afternoon. 3 week wait again for the sides and back. Repeat the process of ensuring they had me down, show up for the half day to complete the car. Oops, we ran out of xpel sheets large enough to cover the back. 4th appt 3 weeks later to complete the car. 8 hours of driving might have made this a break even process. Sounds like a nightmare. Probably worth it over several thousand dollars though. I've seen quotes from 4-6k for my M2. 4k Locally. 6k in more populated and well heeled areas. It's all supply, demand, and what the market can handle. Just labor more than anything with only a couple hundred bucks in material. All that having been said, the $2700 price for full front isn't too far above quotes I've seen for <insert car here>. They probably don't use xpel but it's definitely fine, especially for PTS and European delivery. I'm shocked they aren't charging more. Pretty sure I saw that you could get a dash cam on the Toyota / Lexus configurator as well. They catch on fast and who wouldn't mind PPF or a dash cam with warranty and residualized Saves you from having to take a day or two off work to have it installed. Better to get it upon delivery... that's got to be worth some $$$. Ya, that’s inexpensive. Custom cut and edges wrapped? Even if not, it’s still inexpensive. Agree, factory offered is awesome. Wonder what kind of warranty is included? Lol, who know if I got xpel, all I had for proof was the hundred of so pamphlets in their waiting area. Custom cut, but no edge wraps. I could see dissembling for wraps causing a big jump in price. This was also 5 years ago. i was more talking about Porsche not using xpel. Wrapping edges definitely costs $Texas. Mine was cut from template and still came in at 4k. Was 4400 but I got a deal via the dealer at the same place I was going to take it locally. The M2 has a complex front bumper but not $1600 worth haha. Hopefully that place hasn’t wisened up and your next car is just as cheap to get the wrap on! Thank goodness for crickets. The drivel has been killing me. Radio silence until there's something to say would be awesome. Paid less than half that for XPEL over the same area.